Basketweave Spa is quilted in a textured basketweave pattern in a soft blue green color. 100% cotton, prewashed. This pattern is sold in sets only. The Twin set includes one quilt and one standard sham. The Full Queen set includes one quilt and two standard shams. The King set includes one quilt and two standard shams. Euro shams are offered in a set of two. Basketweave Spa line by C & F Enterprises. Basketweave Spa Twin 2 Piece Quilt set includes one quilt and one standard sham. It is quilted in a textured basketweave design in a soft blue green tone. Quilt is 66"W x 86"L. One standard sham is included in the set, 20"H x 26"W. Basketweave Spa line by C & F Enterprises. Williamsburg design. Manufacturer's UPC code is 008246334316. Basketweave Spa Full Queen 3 Piece Quilt set includes one quilt and two standard shams. 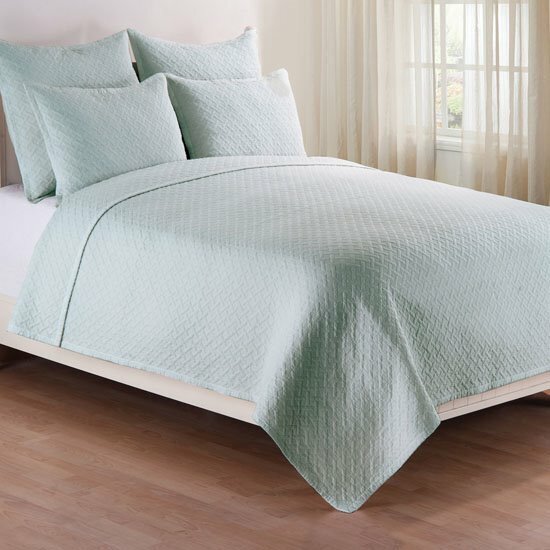 It is quilted in a textured basketweave design in a soft blue green tone. Quilt is 90"W x 92"L. Fits full and queen size mattresses. Two standard shams are included in the set, each is 20"H x 26"W. Basketweave Spa line by C & F Enterprises. Williamsburg design. Manufacturer's UPC code is 008246334323. Basketweave Spa King Quilt set includes one quilt and two standard shams. It is quilted in a textured basketweave design in a soft blue green tone. Quilt is 108"W x 92"L. Two standard shams are included in the set, each is 20"H x 26"W. Basketweave Spa line by C & F Enterprises. Williamsburg design. Manufacturer's UPC code is 008246334330.